Why, at the end of forty glorious years on England’s throne, should these be the great Queen Elizabeth 1st’s final sobering words? This morning, as we all awoke to jangling alarms and a timetable to get us here “on time”, how many of us stopped to consider the real meaning of “being on time”? Doubtless nobody because the thought simply never entered our heads; even if it had, we didn’t have “enough time” and wouldn’t have made it “on time” had we done so! This year is the 150th anniversary of Big Ben- the infamous Westminster clock. It is also the 900th anniversary of Ely Cathedral. What do the two have in common? Both are concerned with time: each is a monument to a point in history and each enshrines something of those moments through its architecture- both physically in its style and energetically in terms of the resonances absorbed through the centuries. Further, both are monuments that mark what we call “time” in some way. Big Ben is a device we call a clock- that is, something which marks our collective conception of time: we look to it for an incremental measure of how much of our day has passed. In the modern world, these increments are based upon the half life figure for the decay of radioactive caesium. Meanwhile, Ely Cathedral is a place of worship where hymns are sung around the seasonal calendar to address the eternal nature of god. Calendars are cyclical by nature: holidays are celebrated at specific points on the wheel of the year and many of these “holy days” are held in honour of the eternal presence of deity in people’s lives. What do we mean by “eternity?” Are we beginning to see here three very different expressions of time? Yet, how often do we think of time as being one specific undisputed fact, a static measure? Think about this for a moment. Calendars don’t help us cook potatoes; football’s official “time out” is not that of the waltz; the mystic and scientist inhabit different timezones. So why beat our lives out to one single version of time? According to the seventeenth century philosopher Descartes, the material universe was nothing but a well-ordered machine operating according to the three dimensional space of Euclidean geometry- an absolute space in which physical phenomena occurred. All changes in this space were described in terms of a separate- and again absolute- dimension called time, disconnected from the physical world, flowing smoothly from the past through the present and into the future. Newton completed the model and subsequently, natural sciences, humanities and social scientists all adopted this base as their foundational premise. Thus in medicine, a healthy body was seen as a highly refined machine whilst a sick person was viewed like a malfunctioning clock; spirit could not influence matter. As a political tool steering the world towards a passive consumerist society, monotheism then science, created a gash between the gods and men so that people perceived themselves as separate servants of god living in a lower material realm subject to a triune concept of past, present and future- the arrow of time flying through a static, predetermined and uncontrollable reality. We move inexorably towards a predetermined future, whilst the past is a place we have left behind. It is this myopic perception of time that causes us to feel stressed: the more entrenched we are in this paradigm, the generally more stressed we feel. Let us consider a little about how we experience time. We speak of time as if we possess a special sense organ that detects the passage of linear time. Since no such organ exists, it has been postulated that certain rhythmic cycles by which our bodies coordinate themselves- known as circadian rhythms- are responsible for our sense of time. But in the face of an infinite number of bodily rhythms, exactly which chronometer do we use? And why choose one over another? One may as well measure the passage of time by how long it takes to boil a cup of rice! For we cannot say the passage of time is the stimulus for perceived time since nothing we know of is being stimulated; and there is no rational basis for “real time;” it is entirely arbitrary. Our sense of time also alters with age: prior to the age of two, we show no sense of duration, inhabiting a kind of eternal now; by the age of two, we understand “today;” “tomorrow” and at three, “yesterday” emerges. By four, “morning” and “afternoon” enter our vocabulary; “days” arrive by five. Our comprehension increases until by sixteen, maturity of linear time comprehension has occurred. Perhaps instead of trying to pin it onto some erroneous notion of “real time” or an “inner clock,” we should adopt an experiential and cognitive approach to our understanding. Time then becomes a felt relationship between our level of perception and the amount of information we are processing; if we are processing a lot of information, we estimate that more time has passed; if we are meditating deeply, we process much less information and so one hour may feel like five minutes. Our feeling about what we are doing also affects our sense of time. If we are thoroughly absorbed by our hobby, we are often surprised- “time has flown:” “we lose ourselves in time,” becoming unaware of its passage. Conversely, if we are performing a task we despise, time becomes cloying; every minute feels like an hour and we check our watches frequently. Yet we cling tenaciously to the idea of an external “real time” to our detriment. We unconsciously construct our ideas about mortality, birth, death, longevity, health and illness around an “absolute time” we view as an external reality even though, these issues are quintessentially experiential; there is no place to go other than to our senses for meaning. Thus, these events are not absolute, but always relative: we can only understand something in relation to something else where it is our construct of time and space that defines the subject and object in a dualistic world. There simply is no absolute external world existing apart from us. We have been seeing a mirror that reflects our own sense impressions; for the fact is, we are a hologram of the whole multiverse and time is a sense impression embedded within that hologram! 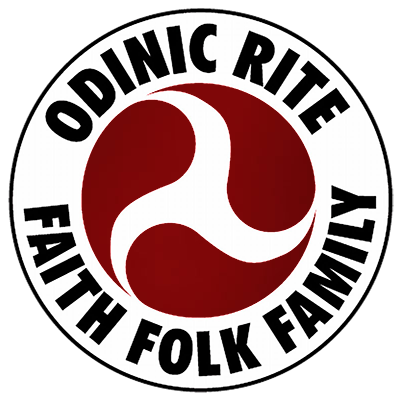 As Odinists, we must realise the triune concept of time with its past, present and future as static entities does not belong to our worldview; indeed, common parlance demonstrates this admirably: “you can’t live in the past;” tomorrow never comes.” Both sayings hint at the truth: there is only an eternal now, an eternal becoming. All so-called ages of the past, our own past and that of others is encapsulated in this “now” and “the future” is the probability born on the wings of our actions within the present. Time is a great wave of change on which we ride; but we are of its substance and so we are co-authors of personal and collective destiny- a destiny which is integral to what is just an endless journey; for there is no final end, just a dance of becoming- either towards evolution or degradation, personally, as a folk group and globally as the human race. Another dimension to our understanding of time is the eternal return. Within wyrd’s great web, there are repetitive patterns and motions and, despite individual differences within the cycles, the overall periodicity and patterning is the same. They also may be suddenly subject to a great cataclysm, which in itself, could be part of a greater cycle. These cycles include the seasons, day and night, the moon’s orbit of the earth, the earth’s orbit around the sun and the solar system’s movements around the great galactic centre; it also includes the life/death/rebirth cycle of individuals, races, species, earth’s cycles, creation and destruction of earthly matter, tides etc. Obviously, man did not continually partake of ritual behaviour; these were special periods when the individual was regarded as becoming his/her true self whilst the rest of his life was passed in profane time- i.e. without meaning. He controlled time; time did not control him as we allow it to today. the eternal which is the vessel for countless cycles and lifetimes, the eternal return etc. There is beginning and end in eternity and it is timebound; but it lays beyond our ordinary ability to imagine. the infinite, which has no beginning and no end and is the unknowable source of all being existing before the point of all creation (known in Sanskrit as the Bindu), and when eternity ceases to exist. In seeking to understand how it is we have these four basic senses of time, we need to consider our multiversal nature of being. For this, I will borrow the concept of the monad from Theosophy. Monads are eternal, unitary, individual life-consciousness-centres, deathless and therefore ageless, unborn and undying. Each monad must have a vehicle through which it can express itself, be it an atom, an animal or a human being and its expression is governed by its position on the evolutionary scale. The Atma – The piece of the divine in everything, often called the divine spark. Buddhi – The vehicle for expression of the divine spark linking man to the divine. Each monad is driven by a spiritual urge to express itself and this is the driving force behind evolution. It is our essence and like a ray that descends into matter. At each stage or layer of descension, some part of our ray is apparently lost as it becomes absorbed by the layers of existence; and all the layers have particular timezones attributed to them. By the time it reaches the Midgarth realm, the ray has been reduced to relying upon the five senses to inform it of its nature and what it perceives as reality in the ordinary waking consciousness state. In this state, the sense of linear time holds sway, driven by the ego complex, which works to guard our survival in this lifetime only. However, by fostering different states of awareness through meditation, dreamwork and ritual practices, we can access our higher states of awareness and timezones existing on the other planes. Our collective ability to do this is modified by the greater cycles such that in the Great Summer, the vitalising Odic currents move freely and multiversal travel is easy, whilst in the Great Autumn and Winter, the veil thickens between folk and Nature, materialism holds sway and we apparently forget our role in shaping wyrd, instead working to conquer Nature and manipulate matter. But the fabric of our folk soul enfolding our wyrd from living countless lifetimes through eternity holds the memory. We are like those Russian dolls where each doll nestles inside another and each is itself a container. This is like our ancestral connection, which we both contain and evolve and the substrate binding us in unity is the coils of the vortex of eternity. As spiritual folk, we may well ask why it seems we have been crippled by our limited perception of time. I believe some of the answer lays in the Myth of Mundelfore. Mundelfore is the Lord of Time, the wielder of the great fire whisk- our holy fylfot. He and his maidens turn the earth. Mundelfore’s nameless father turns the galaxy and another fire whisk turns outer space. Mundelfore has knowledge and awareness of these events through his connection with them; for he is a fractal of the whole. In a distant time, he perceived the coming Ages and called together those powers responsible for the fates of our folk- Urd, his sister, Mimir his wise brother, Odin and his brothers- the shapers of our folk. All noticed the people too had gathered by the “sea of life,” waiting; for Urd had sent them a dream of the cold times ahead. Mimir saw that the people were like children playing and realised they would need skills to survive the coming cataclysms. Crucially, at the end of the Great Winter, a final destructive force would break into Midgarth and it would be humanity’s responsibility to destroy it. So they would need to develop wisdom and learn to build and create. Therefore, it was decreed: Urd gave each a fylgia to guide and counsel them; Mimir granted them smithcraft for arts and runes- the shapes of the lifeforces and language; Mundelfore sent his son Heimdal to teach them whilst Odin and his brothers built a great citadel to watch over the passing generations. Henceforth, we drank from the well of forgetfulness and descended into Urd’s womb of time; for it is only vessels (which are inherently timebound forms)- that can nurture the mystery of form from formlessness and thus action, which is life. That we are guarded by a “watcher within” has been noted by philosophers and scientists alike. In his essay “On the Apparent Intention in the Fate of the Individual,” Schopenhauer wrote of the curious feeling one can have of there being an author somewhere writing the novel of our lives in such a way, that through ostensibly chance happenings, a plot is unfolding of which we have no knowledge. Even more curious is a fact in the annals of psychology recalled by Dr Larry Dossey. Multiple Personality Disorder is a condition in which an individual can have two or more personalities. It is so strange, that in one personality, life-threatening allergies can manifest and yet, be totally absent in another. Further, each personality can be completely oblivious to the existence of one or all of the others. Yet, what has emerged with many of these cases is the existence of a timeless self- one that sees the truth and is aware of all the different personalities within the individual. Heimdal hael! Once we lived according to the template of the sacred cyclical; so we were strong as a folk since we were harmonised with Nature. However, the great wheels have spun and we are at the end of the Great Winter where evil has entered the world: now is our decreed responsibility to eliminate it. For the foe have a great agenda that manipulates an illusory world to prevent progress and keep us locked down in ignorance. Society is geared to the addictive satiation of the senses and technological advance brings with it an obsessive focus on endless productivity to satisfy the whims of a materialistic culture ruled by the ego consciousness. Physical pollutants and noxious propaganda burden our entire beings inducing stressful physiological and emotional responses: such incessant stimulation of our sympathetic nervous systems creates a perpetual state of “fight or flight” and in doing so, our sense of time is chained to the shallow linear mode. Over time, we become addicted to stimulants and stimulating experiences that jolt our nervous systems just to “feel alive.” We fail to realise that to lead a fulfilling life, cycles are nature’s template for regenerating our beings and leading us towards enlightenment. Meanwhile, popular psychology pathologises our very beings: we are all apparently damaged goods, raised by inherently dysfunctional families and need to embrace our inner child completely! Natural emotions such as anger or rebellion are demonised and even having a definite opinion is cited as dogma. The ultimate sin for Indo-Europeans is to be proud of race and culture- the reflex accusation being that we are Nazis. Of course, those making such protestations usually have no idea of what principles originally fuelled Nazism before the reins of politics deformed its unfolding. The fields of psychiatry and psychology are maligned for the benefit of the New World Order whilst covert tactics via the HAARP network and chemtrailing manipulate our very brainwaves- possibly even our sense of time. The aim of course, is control of the unquestioning masses by a nanny state. And the great sacrifice is our evolution. We all have our gard in Odin- our sacred tasks assigned to us by virtue of our genetics, the gifts of the gods, our wyrd from previous lifetimes and our will. It is our duty and birthright to seize the threads of our wyrd and to weave them as we will within the bounds of our circumstances. So shun the modern fashion to value some abilities over others! A classic case in point is “American Idol”- a TV show full of misguided folk who simply do not have the gifts to be a star; sadly, this misdirection of their ego prevents them from fulfilling their true potential. Accept yourself: what are your passions? They are your personal rapture in eternity and clue to your sacred gard. What is your character? This is your strength. Are you stubborn? Turn it into tenacity; Attachment becomes compassion etc. In the world of duality, your “devil” becomes your ally and catalyses wholeness when employed to transcend the duality of expression. Nurture your character; for people who have been psychoanalysed are like filleted fish- they are characterless, often universalists and serve the great agenda admirably! Crucially, we must balance our awareness of time and sacrifice the demon of addiction to linear time. This can be done by identifying with each mode of time daily, altering our rhythm so that we bring more balance to our consciousness. It is the fear of death in all its forms- that we will “run out of time” and cease to be- that is the ultimate illusion; for every mode of suffering is a garment of fear. Fear is “false evidence appearing real.” To our ego complex, linear time brings annihilation, when in fact, life always follows death; it is the natural law seen in the template of the sacred cyclical! accept yourself and your situation. Become serene; surrender. This is like a cleansing spring shower washing away the dross; it’s nature is linear. be mindful. Notice everything about the moment. This is like summer- experience engages the senses and evolves us; so its nature is cyclical. simplify life: see where you are wasting time. This is like autumn- pruning and reaping; just as the eternal cycles do. meditate: put time aside to “just be.” This is like the “rest” of winter, where we touch our infinite, essential self. This alteration of tempo will bring balance because it attunes us to the deeper, regenerative forms that are absent when our consciousness fixates into linear mode; such systemic stress leads to burnout. We shall never truly know what Elizabeth 1st meant on her deathbed. Had those eternal moments- when she could be her authentic self, free of the prison of the linear timeframe so inherent in her daily royal duties- eluded her? I think it possible, don’t you? Life is rhythm and rhythm entrains our consciousness to time and perceptive dimension. Politics is well aware of the power of music to unite people for the purposes of good or ill. During the Wars, the Germans used Wagner to whip up passions and rally people together; recently, the Taliban destroyed archives of folk music in radio stations and outlawed music. Why? Because music can regenerate the folk soul and incite rebellion. Also, certain forms of music entrain us to the frequencies of sacred harmonics, which deepen and expand our consciousness. Listening frequently to Baroque music and particularly Mozart’s symphonies, is known to raise IQ levels. It is interesting to speculate how much the noise of modern life entrains us to a shallow, linear mindset. Music heals and induces specific modes of consciousness depending on its tempo. You can create a “musical diet,” which includes the alpha, beta, gamma and theta waveforms known to induce deeper levels of awareness and synchronise the left and right hemispheres of the brain so they communicate more effectively. We reside in the Kali Yuga; destruction apparently predominates. But really, it is our soul seeing and understanding the destruction wrought by focus on the ego and linear time. Such fixated focus creates energetic blockages that bring dis-ease: ultimately, all dis-ease can be seen as a form of time sickness arising from the ego complex. In reality, time is a compassionate teacher: our eternal soul witnesses the suffering of our egos and through suffering, the way is cleared for productive future growth. This is the symbolic meaning of Skadi hanging the venomous snake over Loki like the mystical narades of eastern philosophy. The great Vedic goddess Kali decapitates the demons of our ego, revels in the taste of their blood, wears a necklace of their skulls and a skirt of their hands. Looking with the eyes of the ego, she is terrifying; looking with the eyes of the soul, she is the compassionate mother who brings enlightenment and without whom there would be no evolution- indeed, no life. Enlightenment is a state of oneness with all things: subject and object cease to exist. However, until that point, we are the dance of duality in the womb of the cosmic mother, the eternal round of the countless lifetimes until we reach that exalted state and become infinity itself. At our core, we are all infinite beings, not the damaged goods as purported by pop psychology. But it is the layers of illusion born of time, which we wear like veils that shroud our beings and hide our beauty. We are the unfolding story, the hero or heroine seeking our bliss in time that will open us to the infinite if we are fylgia-led. Therefore find your passion and live your dreams; for their purpose is to be your own time-transcending maze that teaches the language of the cycles pervading our lives as individuals, as folk and as earthly and cosmic holograms. The footprints of your personal rhythms hold infinity; so every beat is a meditation, a potential moment of enlightenment. The spiritual technology of our religion is the supporting structure that gives you refuge in its mythology and wings to fly with your dreams- when you are ready. Life is process is change is dance. The time to live is now…Hael!